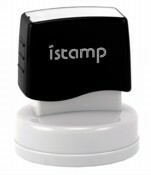 istamp® Pre-Inked Architect/Engineer Seal (1-3/4in. diameter). Excellent impression quality and longevity (up to 35,000 impressions before reinking). New ink formula is now recommended for use on drafting vellum. See below for traditional rubber stamp alternative. Fill in the required fields below and select ADD TO CART. Selecting the Rubber Stamp Seal Option below will open a new product window that can be customized and added to cart separately. IMPORTANT: You must provide us by fax (800-242-7519) or email a copy of the State license certificate showing your name and license number in order for us to process your order. For questions, please call 800-291-5253, option 1 for first available customer service representative, M-F, 8:30a - 5:30p CST.